The original 320 page hand-written journal of Captain Robert Jenkins, during his time as Commander of HMS Actaeon for the year 1857 and HMS Comus in 1857, both ships active off the coast of China, mostly around Canton. 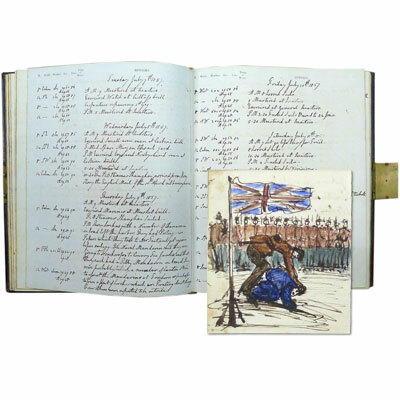 Included is a hand drawn and water coloured sketch of Chinese villagers being forced to kowtow to the Union Jack. Finely bound in contemporary black calf and brass locks. HMS Actaeon was commissioned in 1857 to serve as a survey vessel off the coast of China, under the command of Captain William Thornton Bate. She was present at the bombardment of Canton in 1857,where Bate was shot and killed on 29th. December. Captain Robert Jenkins took over the command of the ship and his journal refers to the bombardment of Canton, surveying factories, disputes over land between British and Chinese merchants. It also covers skirmishes with armed junks and defence of the Barrier. Locations include Hong Kong ,Canton, Macao and Amoy. According to the Journal it appears that Jenkins was wounded seriously on June 30th 1858, and on September 16th ‘Joined Commander J Ward, [vice?] Captain R Jenkins discharged to Half Pay’, September 18th ‘I went to Shanghai with Commander Ward’, from wence Jenkins travelled to Hong Kong, Singapore, Penang, Galli, Aden, Alexandria, Malta, Gibralter, Falmouth, arriving in Southampton 19th November, one month after leaving Shanghai. (29 x 23.5 cm) pp. [144 (1st January to 31st December 1857 as Commander of HMS Comus)] [9 (Summary of year 1857 as Commander of HMS Comus)] ; [7(January 1-19th, last days as Commander of HMS Comus)]  [92 (January 20th to 19th November as Commander of HMS Actaeon)]  [8 (Summary of year 1857 as Commander of HMS Actaeon)] . Paper watermarked ‘1852’ ‘Fellows’. ‘An explorer in the old-fashioned mould of buccaneering Englishmen who roamed the blank spaces of the map’ – The Times. Two first editions of Kaulback’s acclaimed accounts of travel and adventure in Tibet. ‘Ronald Kaulback came down from Cambridge having skilfully avoided reading too many books, or attending too many lectures. 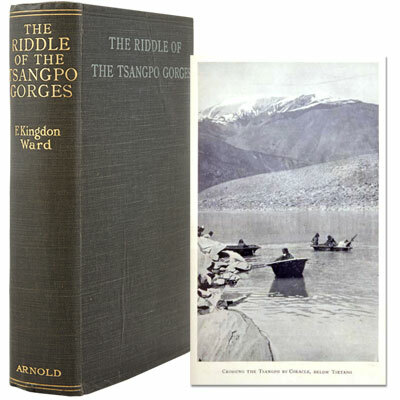 He had no very clear idea of what he wanted to do in life, and so tagged on to an expedition led by F. Kingdom-Ward whose introduction to Tibetan Trek is a wonderful introduction to Kaulback himself’. Kaulback followed this with an eighteen months' expedition in south eastern Tibet searching for the source of the Salween, the black river of Tibet. With one other Englishman and three faithful (and quite enchanting) natives and a good stock of supplies, he collected specimens of insect life, distributed medical care to the very friendly residents and gives a record of their daily progress. Across 3,000 miles of unexplored territory, there were many oddities to be seen, minor discomforts rather than major calamities, to be endured, and plenty of good anecdotes, which he describes in Salween. Both works profusely illustrated with black and white photographs and numerous maps. Both in their rare bright illustrated dust jackets.